Short of getting in a helicopter, the best way to get oriented is from the steeple of the so-called New Church, which was built between 1381 and 1510. Stairs go all the way to the steeple, built in the 19th-century after lightning destroyed an earlier one. 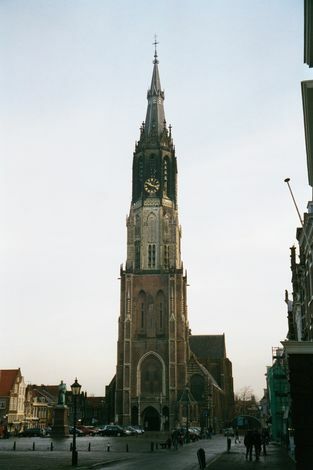 (There had been still earlier fires, including one started by lightning in 1536 that destroyed not merely the steeple but most of Delft.) In winter, when these pictures were taken, it's windy up there.